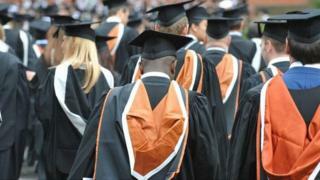 Black male graduates in London are nearly twice as likely to be unemployed as their white counterparts, figures suggest. In 2016 there was an unemployment rate of 18% for black male graduates aged 16 to 24 in the capital. According to the data from the Office for National Statistics (ONS), the rate for their white counterparts was 10%. A government spokesperson said the employment rate for ethnic minorities was "at a record high". More than 83,000 young men in London are from black and mixed black ethnic groups, making up about one in five of young men in the capital. Gary Chimuzinga was initially unsuccessful getting a place on a graduate scheme at a bank after studying Financial Economics with Econometrics at the University of Kent. He then went through Rare, a recruitment company which focuses on placing people from ethnic minorities and working-class backgrounds, and got an internship at Barclays and later got on their graduate scheme. The 23-year-old said he faced "a lot of struggles" during his search for a job. He believes there are several things which hold back young black men in London but "ultimately it comes down to confidence". "We don't have many role models which can give us a bit of confidence, that it is doable," he added. BBC London contacted 50 of London's 500 top graduate employers last year across the banking, accounting, medical, legal and retail sectors. Eleven were able to provide data relating to their employment of black men specifically. Those 11 organisations recruited 1,803 graduates in 2016. Of those, 30 were black men. National director Stephen Hart said the scheme was "hugely popular". "We know more work needs to be done across the system to improve the under-representation of black, Asian and minority ethnic background (BAME) colleagues at a senior level in the NHS," he said. Barclays was one of the organisations which employed the highest percentage of black men. Of 320 recruits, nine were black men. The figures from the Annual Population Survey cover the 12 months ending October 2016. They do show the gap is closing with a decrease from the previous year when the unemployment rate for young black men with a degree in London was 27%. A spokesperson for the Department for Work and Pensions said: "The employment rate for ethnic minorities is at a record high, with 80,000 more people in London finding work in the last year alone. "We've set a target to increase BAME employment by 20% by 2020, and remain firmly committed to that," they said. Is it easier to get a job if you're Adam or Mohamed?